Prime Minister Narendra Modi on Sunday claimed that Congress and its allies “overlooked atrocities” on Kashmiri Pandits as they were more concerned about their vote bank. Addressing a public rally in Jammu and Kashmir’s Kathua district, Modi said, “Due to the policies of Congress, Kashmiri Pandits had to leave their own home. Congress and its allies are so worried about their votes that they overlooked the atrocities on Kashmiri Pandits.” “I would like to ask Congress, who would do justice when they did injustice for 60 years? Will Congress ever be able to provide justice to Kashmiri Pandits? Will they be able to provide justice to those massacred in 1984 riots?” he asked. 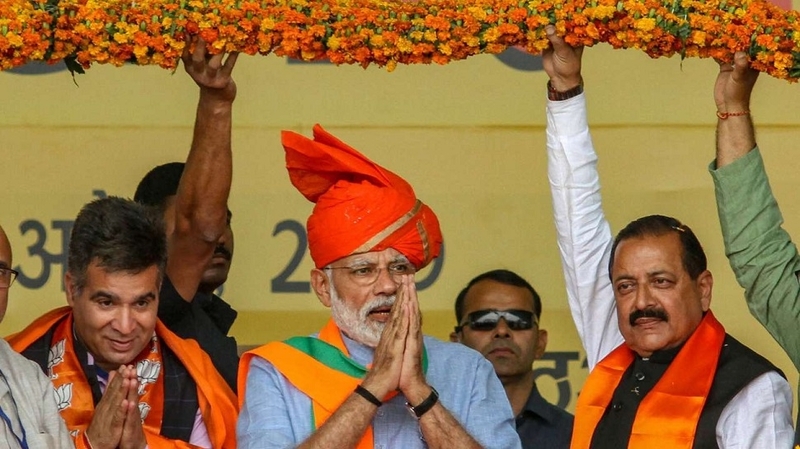 Reaffirming BJP’s commitment towards the welfare of Kashmiri Pandits, Modi said, “Chowkidar is committed to let Kashmiri Pandits live on their land. Work has begun. We’re also making efforts for a law to provide citizenship to families which have come here from Pakistan and believe in ‘Ma Bharti’ (mother India).” Targeting the Opposition for questioning the Centre on national security, the Prime Minister said, “These days ‘mahamilawat’ (grand alliance) and ‘ragdarbaris’ are asking why Modi is talking about national security. Congress is saying that it will remove the Army from Jammu and Kashmir and they will talk to the people who are taking money from Pakistan and influencing the youth of Kashmir.” PM TARGETS ABDULLAHS, MUFTIS, SAYS HE WON’T ALLOW THEM TO DIVIDE INDIA: Prime Minister Narendra Modi on Sunday slammed the Abdullahs and Muftis, saying two families “ruined” three generations of Jammu and Kashmir and he will not allow them to “divide” India. The Prime Minister was referring to NC leader Omar Abdullah’s demand for a separate Prime Minister for Jammu and Kashmir. The Abdullah and Mufti families have “ruined” three generations in the State. They laid seize to the State for three generations. For the better future of the State, they need to be voted out, he told a public rally here. The bright future of Jammu and Kashmir can be ensured only after their departure. They can bring their entire clan into the field, can abuse Modi as much as they want but they won’t be able to divide this nation, the Prime Minister said. Amarinder busy with ‘parivar bhakti’, visited Jallianwala Bagh with ‘naamdaar’ instead of VP: PM Modi: TAKING a jibe at Punjab Chief Minister Captain Amarinder Singh, Prime Minister Narendra Modi on Sunday said the former did not get time to attend the Government’s Jallianwala Bagh event with Vice-President Venkaiah Naidu as he was busy with ‘parivar bhakti’. PRIME Minister Narendra Modi on Sunday said it is due to the strength of Babasaheb Bhimrao Ambedkar’s Constitution that a man from a deprived and exploited class is President, a man from a farmer’s family is Vice-President and a ‘chaiwala’ is the PM. Modi also attacked the Opposition alliance in Uttar Pradesh, asking how those not fighting all the Lok Sabha seats in the State can give a Prime Minister. “It is the strength of Babasaheb’s Constitution that a gentleman hailing from deprived and exploited class has become the President (Ram Nath Kovind), while the Vice-President ( M Venkaiah Naidu) is from a farmer’s family,” he said at a rally in Aligarh district, on birth anniversary of BR Ambedkar, the architect of the Constitution. “Thanks to Babasaheb’s Constitution, a ‘chaiwala’ (tea-seller) is holding the Prime Minister’s post,” Modi said. In an apparent jibe at the SP-BSP-RLD alliance in Uttar Pradesh, Modi asked, “Those who are not contesting on all 40 Lok Sabha seats (in the State), can they give a Prime Minister?” In Uttar Pradesh, the Mayawati-led Bahujan Samaj Party (BSP) is contesting 38 Lok Sabha seats, while the Akhilesh Yadav-led Samajwadi Party (SP) has fielded candidates from 37 parliamentary constituencies. There are three Rashtriya Lok Dal (RLD) candidates in the poll fray from the State. The alliance has left two seats of Rae Bareli and Amethi for the Congress.